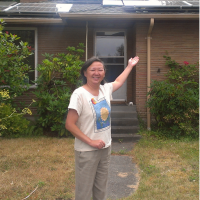 This week, the Solarize Northwest movement reached a major milestone: our campaigns have resulted in over 5 megawatts of solar installations on local homes and businesses! We share this success with dozens of partners and thousands of community members like you who made it happen. Since 2011, Spark Northwest has launched 21 Solarize campaigns throughout Washington and Oregon, educating over 4500 people in the process. With the help of numerous community partners and installers, we have solarized 965 homes and businesses throughout the Pacific Northwest. In case you’re wondering, 5 megawatts of rooftop solar prevents 5,630 tons of carbon dioxide emmisions, which is like taking 971 cars off the road or planting 117,000 trees. Plus it’s resulted in $21 million invested and $550,000 in energy savings for Solarizers every year. Thank you to all of our partners, volunteers, Solarizers and everyone who has attended a workshop over the past seven years. You are powering our clean energy future!